When most people think of Las Vegas, images of casinos and vast deserts are sure to be conjured. It may seem like a hiking guide based around our city would simply be about desert trails, but nothing could be further from the truth. That is where Deborah Wall’s new book, Base Camp Las Vegas: 101 Hikes in the Southwest, comes into play. It is truly a unique hiking guide that takes readers on a tour of 101 different hiking trails found in the vicinity of Las Vegas that includes forested canyons, geological wonders, and some off the beaten path hikes that even locals may have overlooked. 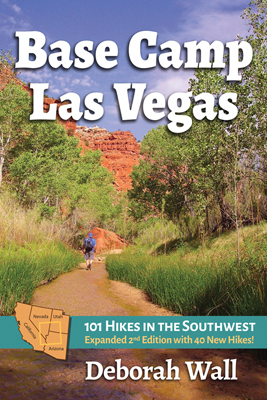 As the name implies, all of the 101 trails in the book are close to Las Vegas. The guide focuses specifically on trails around Southern Nevada, southwestern Utah, northwestern Arizona, and a tip of southeastern California. All of the major national parks are covered—there may be more than most locals realize a short drive from Las Vegas. Zion, Death Valley, and Grand Canyon are all pretty well known national parks, but Wall does a good job of including some locations in or around them that the average visitor may not have found otherwise. For instance, there is a section on a ghost town located just a little off the road outside of Zion NP. Its name is Grafton and there are no signs for it, and since it is not within the park, it is not included on any of the visitor’s guides the rangers hand out. To my surprise, there is a national park in Utah that I have never visited. Capitol Reef NP is about five hours from Las Vegas and appears to be absolutely stunning. The Capitol Gorge Trail, trail number 79, is a great combination of history, native rock art, and nature all along an easy two-mile round-trip hike. It’s not just about National Parks though; there is a good selection of state parks to choose from and some that are in wilderness preserves. One such state park, the Berlin Ichthyosaur State Park in central Nevada, is one that I have not made it to yet. I was happy to find it in the book as I’ve been loosely planning a trip up there for my little paleontologist, Erik. When I showed him the photo of the Ichthyosaur mural at the park and he was quick to point out that it is not a dinosaur, but rather a prehistoric marine reptile. You know I had to check the caption to see and it got it right—the “D” word was not used to refer to our official state fossil! One thing I really loved about Base Camp Las Vegas is that it includes movie filming locations in the descriptions of the applicable hikes. Having grown up in Southern Nevada, I knew plenty of Hollywood films have used our general area for scenes in countless movies over the years but pinpointing where those filming locations were can be difficult. I was happy to find there are a few trails I did not know of that are rather close to me. Bridge Spring Trail, or trail number 33 as it appears in the book, is certainly on my to-do list as soon as the weather permits. This trail takes you to a naturally occurring rock bridge near Nelson, Nevada and according to the guide it’s an easy hike. Overall, Base Camp Las Vegas is a very useful and convenient hiking guide with great information for you to find and plan your future outings in the general area. It seems that almost every page has a beautiful picture of the locations featured in the book and each hike has a summary of how to find it, difficulty level, and any warnings you should be aware of when going there. Deborah Wall has certainly outdone herself with this amazing hiking guide! According to the publisher, Imbrifex Books, this is the first of seven planned Base Camp hiking guides. The 2nd in the series, Base Camp Denver: 101 Hikes in Colorado’s Front Range by Pete KJ will be published in spring, 2019. All of the authors working on the Base Camp hiking book series post monthly articles on BaseCampGuides.com and encourage readers to share their favorite hiking trails. The launch party for Base Camp Las Vegas: 101 Hikes in the Southwest will be at the Clark County Library on August 9th starting at 5 pm. A reception will follow. The event is free and open to the public. More information is available here. Base Camp Las Vegas: 101 Hikes in the Southwest, by Deborah Wall. Also available as an e-book. We hope to see a bunch of the local hiking community at the book launch party on the 9th.